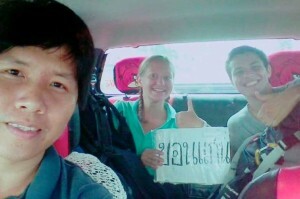 An online post on Facebook got the Thais oohing and aah-ing about the kindness of a Thai driver who stopped to give two young Russians a lift. The Russians had a heavy bag and were waiting in the baking hot sun on the road from Udon to Khon Kaen, reported Daily News. At least they had a sign in Thai indicating where they were headed – namely Khon Kaen. But what was most problematical was that the Russians did not speak English and the Thai driver was not a fluent speaker of either English or Russian. What to do? This was a crisis and they had to think fast to avert disaster. They all got out their phones and went to google translate and managed to find out exactly where they were going by actually pointing to an online map with their hands. Other sign language followed and the day was thankfully saved as international relations received a substantial boost. Finally, the Russian couple gratefully reached their destination safe and sound. The online Thais who saw the smiling pictures on Pheratheap Monthawatchrakul’s Facebook page cooed about the impressive kindness of the driver showing what the Thai milk of human kindness was all about. He told Daily News who found him later that he was happy to help. Large taxis protest? Passengers welcome it!